A new parliamentary inquiry into freedom of conscience over abortion has just been launched. Commissioned by Fiona Bruce MP, it seeks to examine whether the Conscience Clause in the 1967 Abortion Act provides adequate protection for doctors and other healthcare professionals who do not wish to be involved, directly or indirectly, in termination of pregnancy. The closing date for written submissions (online, by email or by letter) is 5pm on Monday 11 July. There are seven questions and a maximum limit of 500 words per question. They include: Why is freedom of conscience important? Do doctors and other health professionals have enough protection? Can you give examples of good or bad practice? Do you know of good precedents from elsewhere in the UK or abroad? What legal or regulatory changes would you suggest? 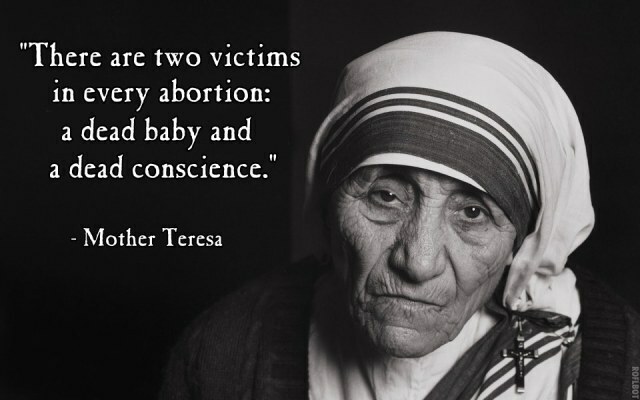 Section 4 of the Abortion Act (1967), the ‘conscience clause’, requires that ‘no person shall be under any duty, whether by contract or by any statutory or other legal requirement, to participate in any treatment authorised by this Act to which he has a conscientious objection’. Its purpose is to ensure that people with a conscientious objection to abortion are not put under coercive pressure to take part. The application of the clause has been the subject of much legal and ethical debate and has also been tested in the courts. Most of the debate centres around the meaning and scope of the two words ‘participate’ and ‘treatment’. There is general agreement that the clause protects doctors or nurses from being forced against their consciences to be directly involved in carrying out abortions – for example by performing or assisting an operative procedure or administering abortifacient drugs. But what about preparing a patient for surgery, attending them afterwards, supervising others doing abortions, typing a referral letter or being part of the referral process? Here the application is less clear. The problem is that legal precedent and professional guidelines vary in how they interpret and apply the conscience clause. Furthermore Hale added that any medical professional who refuses to provide an abortion ‘must arrange for a referral to someone else who will do so’. This legal ruling conflicted with 2013 General Medical Council (GMC) guidance that doctors are not obliged to refer patients seeking abortion to other doctors who will do it but must ‘make sure that the patient has enough information to arrange to see another doctor who does not hold the same objection’. Clause 4.4 of the Nursing and Midwifery Council (NMC) Code allows for conscientious objection in only limited circumstances. But a new position statement on abortion from the Royal College of Midwives (RCM) narrows this protection even further and states that midwives should be involved in all care of a woman undergoing a termination. They have the right to opt out on the basis of conscience only from those clinical procedures directly involved in the abortion. Furthermore, both the NMC and RCM make referral to another competent practitioner mandatory. Many would consider that a referral for abortion is actually participating in abortion. If I do not physically take part in an immoral act but knowingly provide others with the means to do so, am I not equally culpable? In fact doctors in New Zealand felt so strongly about this that they took their regulatory body, the NZMC, to court for suggesting referral was an obligation, and won! The NZMC subsequently dropped its appeal of the ruling. The European Convention of Human Rights (ECHR) and the Equality Act 2010 are also relevant here. The Equality Act 2010 prohibits discrimination on the grounds of religion and belief and Article 9 of the ECHR guarantees freedom of thought, conscience and religion. There is a duty under the Equality Act to make 'reasonable accommodation' for those who have a disability and the argument is that there should be similar provision for religious beliefs. As Professor John Wyatt has argued in a useful CMF File, the right of conscientious objection is not a minor or peripheral issue. It goes to the heart of medical practice as a moral activity. Current UK law and professional guidelines respect the right of doctors to refuse to engage in certain procedures to which they have a conscientious objection. This applies not just to abortion but to other activities as diverse as artificial reproduction and gender reassignment. Christians are called to show respect for governing authorities (Romans 13:1-7), but this is not a call for unquestioning obedience. Ultimately we obey God and not men (Acts 5:29).When the King of Egypt ordered the Hebrew midwives to kill all male Hebrew children they refused to do so and God commended and rewarded them (Exodus 1:15-22). This new consultation is timely. It provides a great opportunity for anyone with strong feelings on this issue, and especially those with experience of how the conscience clause works in practice, to provide input which may help to shape future law and regulations. It’s an opportunity well worth taking – especially for doctors and nurses. Please visit the Inquiry website www.conscienceinquiry.uk where you will find more information. The first motion (79 on the agenda) affirms that ‘it is not appropriate at this time to debate whether or not to change existing BMA policy’. Only if this is not passed will debate take place on the second motion (80): ‘that this meeting believes that the BMA should adopt a neutral stance on assisted dying’. 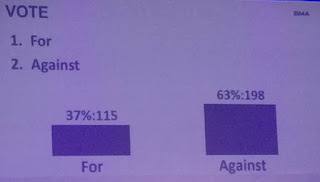 Were the BMA to drop its opposition, and as a consequence a law were to be passed, it would also leave the medical profession hugely divided at a time when, perhaps, more than any other time in British history, we need to be united as advocates for our patients and for the highest priorities in a struggling health service. 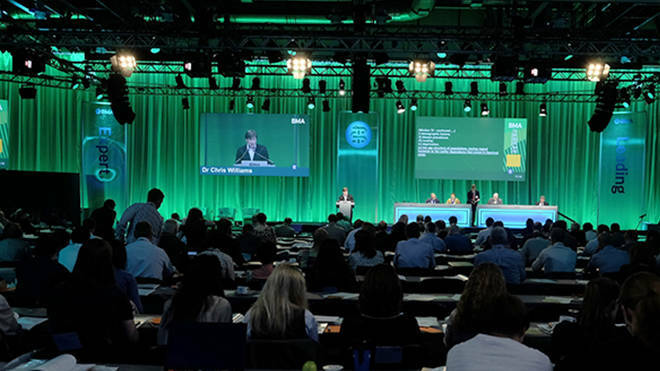 The British Medical Association (BMA) rejected an attempt to move it neutral at its ARM in 2012 saying that neutrality was the worst of all positions. This was based on bitter experience. When the BMA took a neutral position for a year in 2005/2006 we saw huge pressure to change the law by way of the Joffe Bill. Throughout that crucial debate, which had the potential of changing the shape of medicine in this country, the BMA was forced to remain silent and took no part in the debate. Were it to go neutral again it would be similarly gagged and doctors would have no collective voice. Going neutral would instead play into the hands of a longstanding campaign led by a small pressure group with a strong political agenda. 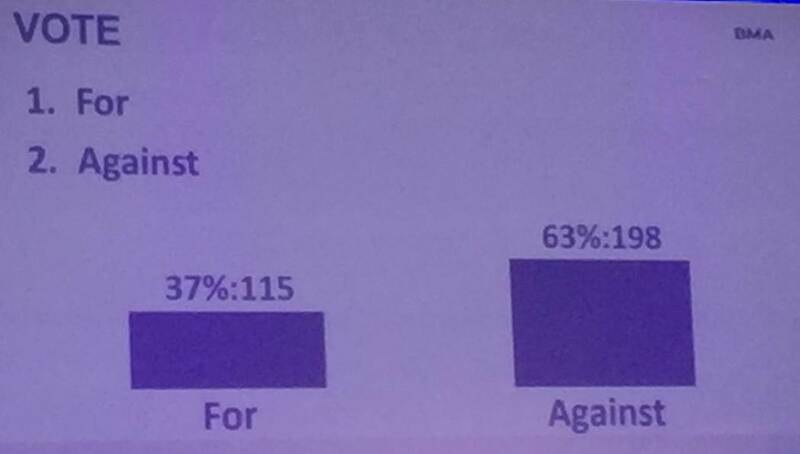 Healthcare Professionals for Assisted Dying (HPAD), which is affiliated to the pressure group ‘Dignity in Dying’ (formerly the Voluntary Euthanasia Society), at last count had just over 500 supporters, representing fewer than 0.25% of Britain’s 240,000 doctors. The BMA has been historically opposed to a change in the law on assisted suicide and euthanasia for good reasons. These reasons have not changed. The BMA ARM would be wise to give short shrift to this latest neutrality proposal. The issue has been debated to death in recent years and the views of parliament and the medical profession in this country are settled. There are many more pressing and crucial matters on the ARM agenda. It is time to give this one a well-deserved rest. A new IVF-based technique ‘is likely to lead to normal pregnancies and reduce the risk that babies born will have mitochondrial disease’, according to researchers at the Wellcome Trust Centre for Mitochondrial Disease at Newcastle University. Published today (Wednesday 8 June 2016) in the journal Nature, scientists report the first in-depth analysis of human embryos created using a new ‘three-parent’ technique devised to reduce the risk of mothers passing on mitochondrial disease to their children. Mitochondrial diseases are inherited maternally and cause a variety of severe conditions that currently have no cure. The UK government has recently legalised the controversial use of embryos carrying DNA from three genetic parents to prevent their transmission, but the proposed techniques have been criticised on both ethical and safety grounds (see my previous review). 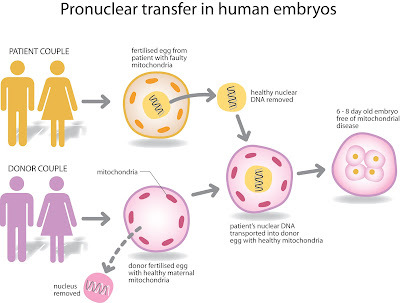 One of these techniques, called ‘early pronuclear transfer’ (see picture), involves transplanting the nucleus from a fertilised egg into a donated egg, which contains healthy mitochondria, shortly after fertilisation. Today researchers, in a study involving over 500 eggs from 64 donor women, published results which they say show that the new procedure does not adversely affect human development and will greatly reduce the level of faulty mitochondria in the embryo. They further claim their results suggest that the technique will lead to normal pregnancies whilst also reducing the risk of babies having mitochondrial disease. The results of the new study will be considered by the Human Fertilisation and Embryology Authority‘s (HFEA) Expert Scientific Panel. The HFEA will ultimately decide whether to issue the first licence to a clinic. 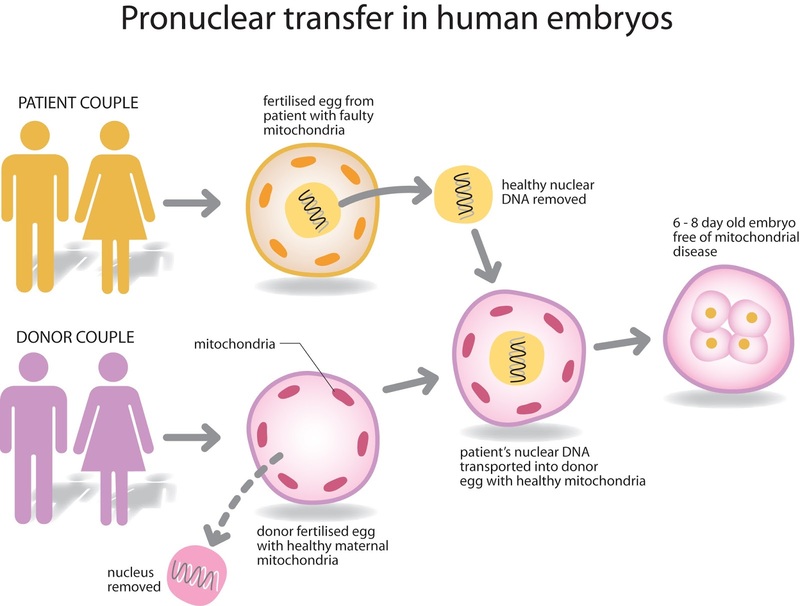 A licensed clinic would allow couples affected by mitochondrial disease to have the choice of whether to use pronuclear transfer to try and have healthy children. This new research might have calmed the nerves of already committed enthusiasts for this controversial technique but it leaves many questions still unanswered. The Newcastle researchers admit in their press release that one of five stem cell lines derived from embryos they created showed an increase, rather than a decrease, in the percentage of mitochondrial DNA carryover (this important fact is left out in Fergus Walsh's misleading BBC report). Rather than bringing reassurance this actually confirms concerns highlighted just one month ago by another researcher in the same journal Nature that three-person embryos ‘may fail to vanquish mutant mitochondria’. Scientists in New York showed that ‘even if a small number of mutant mitochondria are retained after the transfer’ – an admittedly common occurrence — they can ‘outcompete healthy mitochondria in a child’s cells and potentially cause the disease the therapy was designed to avoid’. Early embryos that ‘look’ normal (they were only grown to six days) do not necessarily translate into older embryos, fetuses, babies and children that are normal. The deep concerns that this technique will not work, or will work partially producing a whole host of new problems, have not yet been addressed. It is noteworthy that this other US research has not been given attention by the Newcastle team and the BBC. Not as convenient perhaps? Serious ethical and safety concerns remain, including the risky and invasive harvesting of large numbers of human eggs from donor women and the identity confusion of genealogically confused progeny, if we ever get that far. Adoption of children, babies or embryos still remains a viable and safe alternative for these families and DNA editing, which has already been successfully used to prevent transmission of mitochondrial disease in mice, is a far more precise, specific, clever, natural and ethical solution to this problem than stripping nuclei out of embryos and transplanting them into donor eggs. The end does not justify the means and the greatest scientific advances are always ethical. The human embryo must always be treated with the utmost respect. It is noteworthy that Shimya Yamanaka, the 2012 Nobel prize winner, through patient and meticulous research, discovered an ethical alternative to embryo research that revolutionised scientific thinking and won him a Nobel prize. By contrast, this new research is unnecessary, unethical and still unproven to work in non-human primates, let alone human beings. We should put a halt to it and instead pursue scientific solutions that are more safe, natural, ethical and scientifically precise – more Michelangelo than Picasso. This is a boundary that should not have been crossed. There are other options (see my blogpost on ‘thirteen solutions to mitochondrial disease assessed’) which offer better solutions.